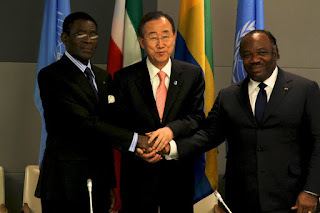 United Nations Secretary-General praised President Obiang Nguema Mbasogo of Equatorial Guinea and his counterpart, Ali Bongo Ondimba of Gabon, for "statesmanship" in their efforts to resolve a long-standing territorial dispute. President Obiang met on February 25 with President Bongo at the United Nations (UN) headquarters at the invitation of the Secretary-General. The UN began mediating the dispute in 2004. The two presidents reaffirmed their commitment to submit the dispute to the International Court of Justice with the goal of reaching a settlement as soon as possible. Secretary-General Ban reported to the Security Council that the attitude of the presidents was "an important demonstration of statesmanship, on both sides." He declared that the two nations would "have the full support of the United Nations as they work together to find a solution." The dispute between Equatorial Guinea and its neighbor centers around three islands in Corisco Bay, in an area of petroleum and natural gas deposits. The two countries have a long-standing commitment to resolve the matter amicably and to exploit the area's resources jointly until they reach a settlement. In a joint communique issued following the meeting of the two leaders and Secretary-General Ban, the two countries agreed to meet again in Geneva on March 29-30 to resolve remaining issues. The President of Equatorial Guinea, Obiang Nguema Mbasogo, will participate in the G20 summit that will take place in the Mediterranean city of Cannes in November. The President of the Spanish Congress of Deputies, José Bono, during a recent visit to Equatorial Guinea, expressed support for President Obiang’s objective to have the AU adopt Spanish as an official language. Equatorial Guinea is the continent’s only Spanish-speaking country. United Arab Emirates, the presiding country of the Cooperation Council of the Arab States of the Gulf; Ethiopia, which presides over the Orientation Committee of the new Association for Africa’s Development; and Singapore, which will represent the 27 countries of the Global Governance Group (3G). 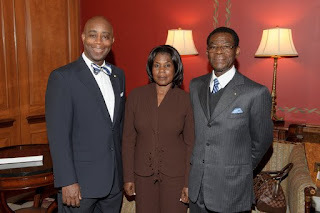 President Obiang Nguema Mbasogo held meetings with members of the House and Senate on Thursday, the second day of his unofficial visit to Washington. After the close of the annual National Prayer Breakfast, President Obiang met with Rep. Robert Aderholt (R-Ala.). Rep. Aderholt maintains a keen interest in Africa for several years. He has visited several countries on the continent and met with many African leaders in his efforts to learn about the continent and African culture. Rep. Aderholt is a member of the Commission on Security and Cooperation in Europe (CSCE), commonly known as the Helsinki Commission, which is the Congress’s principal human-rights watchdog, and is deeply concerned about issues of human rights and religious liberty. President Obiang held an afternoon meeting with Sen. James Inhofe (R-Okla.), one of the most ardent promoters of Africa in the United States Congress. Sen. Inhofe, who is known for saying, “…I have a heart for Africa,” has made more than 100 country visits to Africa and has encouraged his fellow members of Congress to travel to Africa and learn about the continent. In the evening, President Obiang attended a special dinner for African leaders hosted by Sen. Inhofe at the Capitol. Mr. Obiang’s visit to Washington follows his election as chairman of the African Union (AU) at the organization’s summit, which was held in Addis Ababa, Ethiopia, January 30-31. In his acceptance speech, he urged African governments to make greater efforts to resolve the continent’s problems. President Obiang Nguema Mbasogo of Equatorial Guinea attended the National Prayer Breakfast this morning in Washington, D.C. on the second day of an unofficial visit to the United States. Yesterday, he was hosted for lunch in the Capitol by the Chaplain of the United States Senate, Rev. Barry C. Black. The National Prayer Breakfast has been held annually in Washington since 1953. It is part of a week-long series of meetings, luncheons, and dinners during which members of Congress meet privately with individuals and groups, both American and international, to discuss matters of mutual of interest. President Obiang will meet with members of Congress and representatives of industry while in Washington. President Obama addressed the 2011 breakfast, as the President of the United States traditionally does. Every U.S. President since Dwight D. Eisenhower has participated in the event. Some 3,500 guests attended this year’s breakfast, including members of the U.S. Congress and Cabinet, the diplomatic corps, foreign leaders, and private citizens. Invitees attended from more than 100 countries. Rev. Black, a retired rear admiral in the United States Navy, is the 62nd Chaplain of the United States Senate, which named its first chaplain in 1789. He served in the U.S. Navy for more than twenty-seven years, ending his distinguished career as the Chief of Navy Chaplains.